A few years ago, before I ever thought about being a Blogger and I was just a Googler, I used to check two sites all the time for recipes and inspiration. One of the sites was 101CookBooks and the other was Sweet Tartelette. You can imagine my personal joy to actually meet and workshop with the charming, funny, generous, and lovely Helene Dujardin, who genuinely deserves the moniker: Sweet Tartelette. For a few hours on a Saturday morning, Helene led us wide-eyed Food Bloggers through a Macaron workshop. When we arrived, the work tables were already set up with a gift bag for each of us that contained: A Pastry bag, A Pastry tip, a full bottle of powdered food coloring, a bottle of water and a bag of pistachios. It was a great touch that made you feel like you had won something just for showing up. Then, Helene thanked the three ladies who had arranged this visit and opportunity for us all: Rachael of LaFuji Mama, Gaby of WhatsGabyCooking, and Jen of Devour The World. All three of these gals are adorable and multi-talented bloggers. Macarons have become a "medal of honor" to many bakers. We knew this was our chance to have the "Macaron Master" teach us "pastry grasshoppers" how to make magic out of ground almonds, powdered and granulated sugar, and those ever mercurial damned egg whites. Helene did not disappoint and was amazingly generous with her individual attention and her expertise. In a world where people litigate over the ownership of everything from a lottery ticket to a twinkling star in the heavens, here was a talented chef ready to share any and all knowledge about her craft. Helene's personality is an amazing combination of "passionate, cool, hip" French-ness and "friendly, down-to-earth, neighborly" Southern American. In one sentence you may hear the lyrical kiss of a French accent, but the sentence could end with "yawl". She is what you would hope for: Super talented without any "Diva-tude". If someone had peeked in on our little baking troupe that morning they would have snickered at how we oohed and aahed over egg whites, and stared at electric mixers whipping as if they were spinning gold in front of our very eyes. Even Helene had to laugh at how intense we all were, how focused we watched her every move and how kid-like we giggled over the vibrant colors. And how we all became complete Foodie-Photo nerds when the chance of having "feet" (the little lacy bottoms that are so desired, yet so elusive) on our macarons became a reality. The Macaron workshop was a great mixture of fun, learning, hands-on lab work and meeting new friends. Nice combo, wouldn't you say? 1) Measure out your egg whites, and all ingredients carefully and using a scale is preferred. 2) Aging the egg whites makes a huge difference; the more age the less liquid and it is liquid and moisture that is the enemy of success for these sweet treasures. 3) Beat your egg whites til very foamy and light before pouring your granulated sugar in like rain over the white while continuing to beat. 4) Beat your egg whites until they hold a stiff peak, glossy and firm rather than loose. 6) Once color, etc. has been added, continue to fold (less aggressively) until the mixture folds back on itself and settles to the count of 5. In other words, if you draw your spatula through the center, the mixture returns to itself and settles in about the count of 5. 7) Have everything ready ie.. pans with parchment, etc. before filling your pastry bag. Once filled, tilt your tip to the parchment and squeeze lightly from the top, lifting at the count of 1,2,3 lift. 9) Bang your pan straight up and down on the counter a couple times to settle any bubbles, but be careful not to tilt the pan. 10) Put your macarons in a preheated oven at 280F for convection, 300F for regular gas or electric, for about 15 - 20 minutes. Cool for a few minutes and remove each one carefully to finish cooling on a rack. All of these tips have been posted (and much clearer) on Tartelette's site and in her articles for Dessert Magazine. Although none of these written tips are nearly as good as having her eyes and guidance in person, it's a good start. If you have the chance to take her workshop or can help organize her visit to your city to lead a workshop; DO IT NOW! I was thrilled to have them come out so delish. I've included my added steps for these below, and you can follow the link [HERE] for the recipe at Tartelette. + Rub 1 tsp. of zest from a blood orange into the powdered sugar and almond flour. + Remove the dried segments and grind to a powder. Add this powder to the bowl half way through the mixing of your flour and meringue. + I added several drops of gel food coloring (mixed to make orange) at the same time to the mix. 2 Tbls. butter Melt in a double boiler, stirring to make creamy. Remove and let cool to room temp. before piping as a filling. Quote from Deb, my Sister-in-law: "Can I have another one of those before you put them away, I think these may be the best dessert thing you've ever made." Love the color of those blood orange macarons - beautiful! I saw your picture on TasteSpotting. Love the idea of blood orange macarons and dark chocolate ganache - YUM! Great macaron tips! I am jealous of your amazing workshops with Tartlette. I'm excited to read about her food photography and styling workshop! You macarons are STUNNING! Helene will be so proud when she sees them! Thank you so much for coming--it was so nice to finally meet you. I hope to see you again soon! WOW!! What a great post and awesome photos of the class!! These macarons look fabulous - I haven't attempted an at home batch yet but since I LOVE orange and chocolate together I think I am going to have to try your version!! It was great to meet you at the class - read through your blog and we have a lot in common!!! Hope to see you at another event!! It was so nice to see you again! And I agree that those macs are the bomb! Worthy of Tartelette herself! Thank you, Chocolate Shavings, 52Kitchen Adventures for finding me and leaving such sweet comments. I checked out your blogs and love them. Bookmarked both. 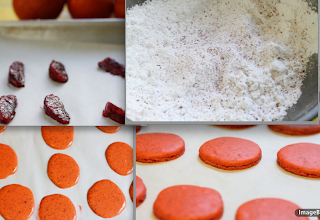 Cathy, it was great meeting you this past weekend, your blood orange macarons turned out beautiful! I can't wait for your next post! Wow, your blood orange macarons look absolutely perfect and so beautiful!! Wow! What a great post! The combo of blood orange and chocolate sound incredible!!! I still haven't tried making these! Dang I wish I had been at this workshop..
Cathy, it was really nice meeting you! Merce, so nice meeting you too, loved your spirit. Kate: thank you so much, and I loved seeing Nuni with you. Memoria and Kathleen - nice to meet you, thanx for stopping by here. Daydreamer - your blog post was so fun. Wowzers! Your blood orange macs look wonderful. I t was good meeting you and I'm glad we all had such success learning from Helen. Cathy: it was so much fun spending time getting to know you. Feels like I got a new friend for life. Love that picture of the two of us! Thank you for a great time in L.A! So cool. I've been saving this post in my reader to really read it. Helene seems like such an amazing woman, so I'm sure that the class was sensational =D. They look lovely, they are on my list to make :) yours are really stunning!